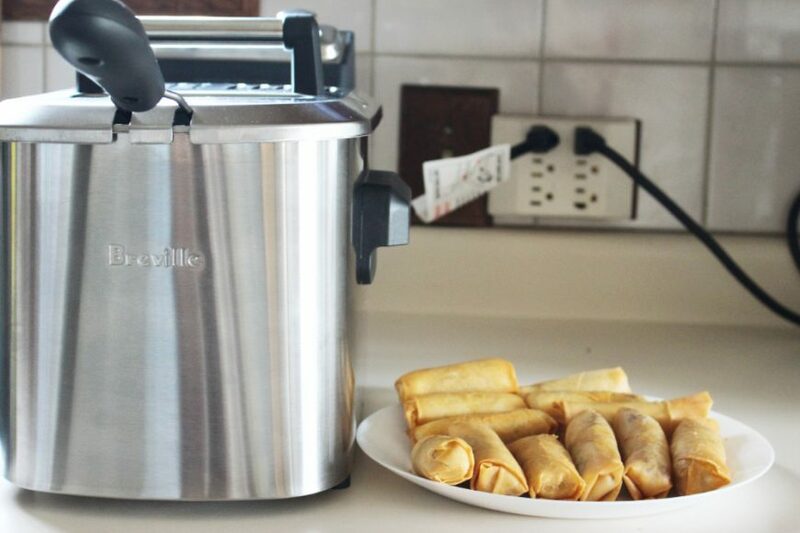 DISCLAIMER: We received the Breville Smart Fryer as compensation for inclusion in this Thai Spring Roll post. All opinions expressed in this post are 100% my own. As always, if I don’t love it, I won’t share it! Everyone loves Thai food! You can’t not like Thai Food. I try to incorporate elements of Thailand in a lot of my cooking! 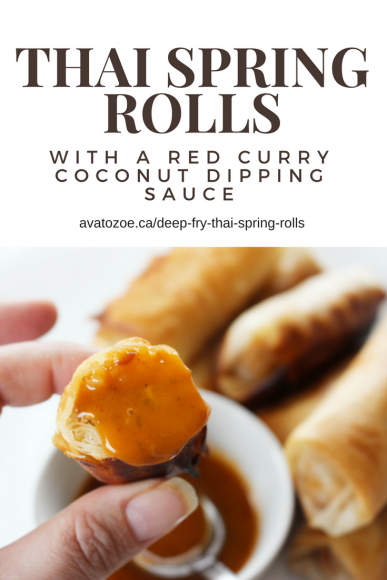 Obsessed with spring rolls and Thai food, naturally I would create Thai Spring Rolls. 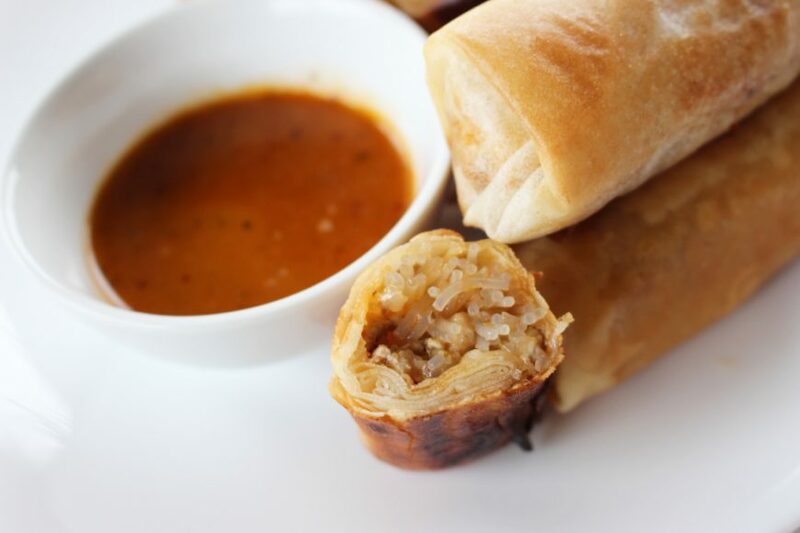 When you find a good spring roll, you’ll never forget it! I have my place that makes the best spring rolls but unfortunately, this place is in Saskatchewan! Determined to recreate them, I took to the kitchen. and unfortunately came nowhere close but did end up creating my own version that leaves a very lasting impression. Now the worst part for me about spring rolls was that they need to be deep fried. Since I had never owned a deep fryer, this meant many many oil burns and very messy cleanups of splattered oil. If I was going to keep experimenting in the kitchen, I knew that I’d have to make the investment into finding a deep fryer that worked for our family! After researching different deep fryers from various brands, I found one that would change our frying habits forever! If your kids are anything like mine, they love a good french fry but hitting the drive-through is no way to live and french fries in the oven just don’t taste the same. For this reason, we chose the Smart Fryer from Breville which gives you the freedom to indulge in the foods you love right from the comfort of your own kitchen! The Smart Fryer is the first to offer homemade twice-fried fries and is probably our most used setting so far! This setting replicates that restaurant french fry with the soft texture inside. The twice-friend setting first blanches the fries at a low temperature and then cooks them at a high temperature to crisp the outside of the fry! The other thing that made me fall for the Smart Fryer is the 7 pre-programmed settings on the LCD display. Trial and error is part of recipe development but having these settings has helped take some of the guesswork out of figuring out times and temperatures. The Smart Fryer automatically adjusts cooking times and temperatures for fresh or frozen food so food will come out crispy and delicious. 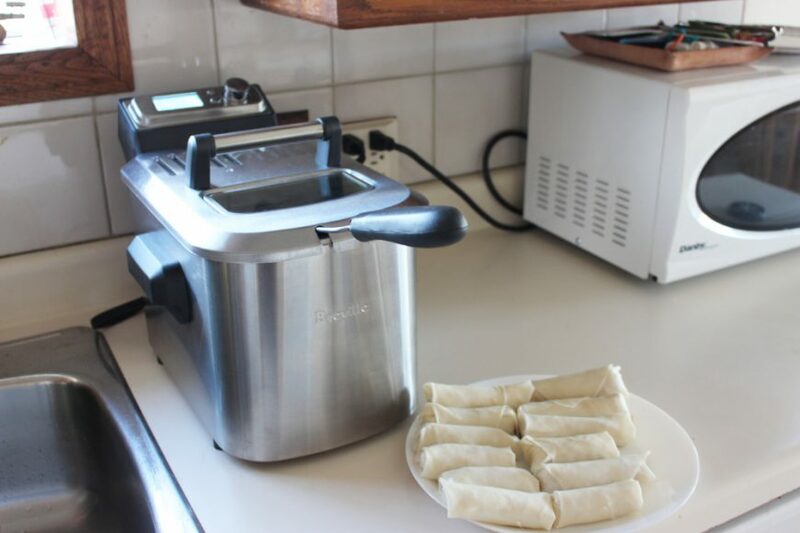 In my case, I love creating unique recipes like the Thai Spring Rolls that require cooking outside of the preprogrammed settings, the user‐friendly custom settings let me set my own time and temperature. 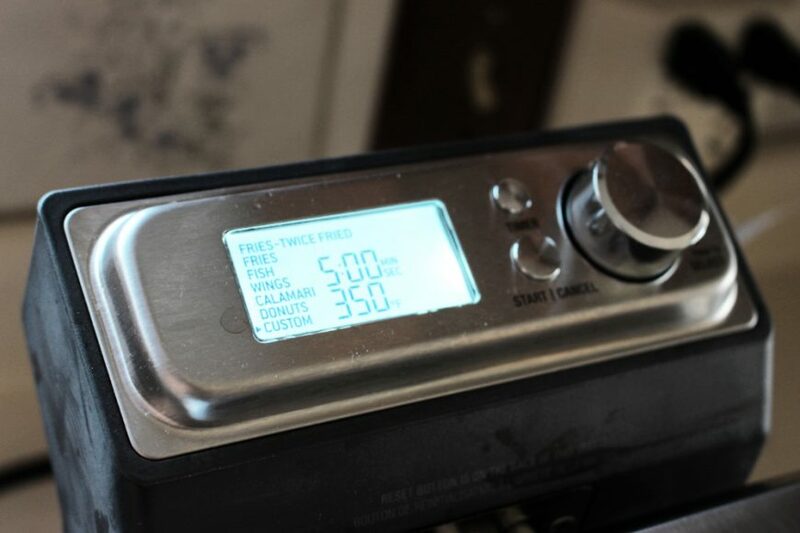 Another amazing feature is the Quick Recover feature which rapidly brings the oil temperature back up to an optimal level, lets you continue deep frying without having to adjust cooking times because of overheated oil. I promise you this Thai Spring Rolls recipe will take you longer to make and to clean up after then it will for your guests to devour them. They last maybe 10 minutes in my house so double batches are a real thing over here. Speaking of clean up though, it’s even easier as the watt element and permanent mesh filter are removable and the mesh filter is dishwasher friendly to simplify your cleanup! Breville’s Smart Fryer BDF500XL is now available at retailers across Canada at the retail price of $199.99. Now are you ready to make your own Thai Spring Rolls? Let’s get cooking! Heat oil in large skillet. Add ground pork. Once the Pork is fully cooked, add 1/2 the can of Coconut Milk. Stirring frequently, cook over a medium-high heat until sauce is thickened. Remove meat mixture to plate. In the same frying pan (don't clean out), add 1 tablespoon of Curry and remaining Coconut Milk. Bring to a boil and add lime juice and sugar. Stirring frequently, cook until curry is dissolved and sauce is thickened. Set Aside. Boil 2 cups of water, adding one bundle of vermicelli noodles once the water is boiling. Put the lid on and remove from heat! Let side for 1 minutes. Fully drain the noodles and set aside as now we can begin rolling. Begin rolling the spring rolls by place spring roll wrapper on a diamond shape on a flat surface. Spread about 1 tablespoons of meat filling, and top with additional 1 tablespoon of noodles in a line, leaving about an inch on each side. Gently and carefully, fold the corner that's closest to you over the filling, and then tuck under the filling. Fold both side corners toward the center of the wrapper, it will start to look like an open envelope. Dip your fingers in egg white and run it along the edges of the wrapper to seal better. Carefully roll up the spring roll. Sometimes I will double wrap them depending on my mood for an extra crunch or if I accidentally rip a wrapper, I will double wrap them to salvage the spring roll. Place 3-4 wrapped spring rolls in the deep fryer under custom setting at 350 F for 5 minutes or until golden brown. Serve with Coconut Curry Sauce you set aside earlier! To learn more about the Smart Fryer or any other Breville products visit www.breville.ca. Needing some more recipe inspiration? Check out my Pinterest Board HERE! 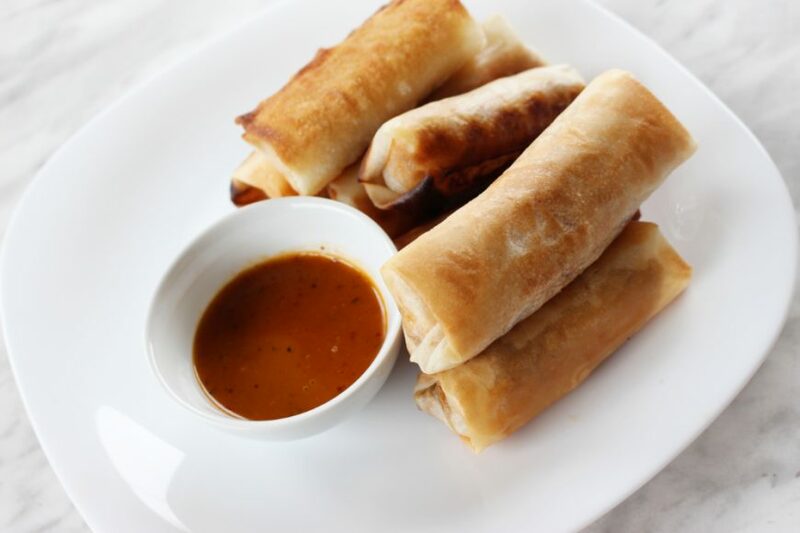 These Thai Spring Rolls are guaranteed to have your guests talking for more parties to come…GUARANTEED! Next articleBeautiful Lashes & Brows In As Little As 4 Weeks! These look scrumptious. I’m curious, how much oil do you have to pour into the deep fryer? What kind of oil did you use? Can you reuse the oil for other recipes? I used about half a jug of canola oil and so long as you’re making the same type thing you can reuse it for a while. I change my oil when I switch from say fries to something sweeter just so flavours don’t cross! But We’ve been on a twice fried french fry kick for a while now! SOO good! MMMM. Janette you made this post VERY tasty looking. I seriously want more posts on recipes for your deep fryer because it is something I haven’t really thought about for using at home. What recipe are you thinking of next? Sweet? Savoury? I’ll be sharing another spring roll recipe soon but a very very different version! I haven’t even wrapped my brain around the sweet yet but it’s on the list! I keep thinking of something with apples! Yumm! These sound delicious! Now if only I hadn’t tossed out our deep fryer when we moved!! Time for a new one.. perhaps one with a twice-fried french fry option.. just saying lol! Yum! Thai spring rolls are my absolute favourite. Yours look so good. I never thought I could make them at home but you’ve inspired me! They’re a lot of work at home but SOOO worth it, I’ll never go back to store bought! These look so delish, Mama!!! LOVE! The recipe looks delicious, I’ve never used a deep fryer? I’ve been thinking about getting a deep fryer for game day snacks, I’ll have to check this one out! all I”m saying is twice fried french fries!! Enough said! These look DELICIOUS and you made it look way too easy to make. Is it really THAT easy? I came here to ask the same question as Dee. My parents used to have a restaurant, so it was a commercial fryer, and that’s a different kind of beast altogether as it’s used so much. I’m dying to try these ! I don’t have a deep fryer though. Would you recommended pan frying ? You totally can, it’s how I made them for years but I also got burned A LOT…you have to be very careful and it takes Wayyy more time!! You should come over soon for some spring rolls!